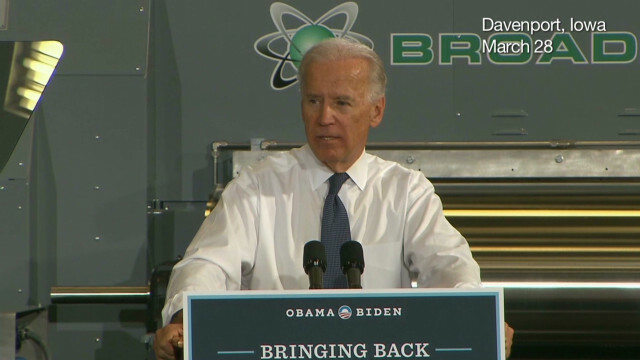 Vice President Joe Biden went further than President Barack Obama has on supporting gay marriage. (CNN) - Apparent White House division over gay marriage - with Vice President Joe Biden saying Sunday that he is “absolutely comfortable” with the idea, going further than President Obama has on the issue – mirrors a nation that is evenly divided on the matter. Recent polls show that about half of Americans favor legalized gay marriage, while half oppose it, with support for the idea gaining significant ground over the past 15 years. Pew’s latest polling on the issue, conducted late last year, found that 46% of Americans support favor allowing gays and lesbians to marry legally, while 44% are opposed. Support for gay civil unions is substantially higher, with a clear majority of Americans supporting such arrangements. Feelings about gay marriage correlate to various religious traditions and levels of religiosity, with those nonaffiliated with any religion most supportive of gay marriage. It’s worth noting the dramatic recent shifts on the issue among Roman Catholics, whose ranks include Biden. Despite the Roman Catholic Church’s rigorous opposition to gays getting the right to marry, Pew found that Catholics support gay marriage by a margin of 52% to 37%. That’s a shift from 2010, when just 46% of Catholics favored gay marriage. Among white Catholics, support is even higher at 57%, while Hispanic Catholics are evenly divided. The religious group most opposed to gay marriage is white evangelical Protestants, among whom 74% oppose it, according to Pew. Sixty-two percent of black Protestants, a key part of President Obama’s political base, also oppose gay marriage. "What the VP said - that all married couples should have the same legal rights - is (precisely) POTUS' position," said David Axelrod, a senior adviser to Obama's re-election campaign, in a Twitter message. The issue has gotten attention recently as North Carolinians prepare to vote Tuesday on a ballot initiative that would amend the state constitution to ban gay marriage, reinforcing a state law banning such unions. The Rev. Billy Graham has endorsed the measure, while former President Bill Clinton has taped a robo call opposing it. Marriage is not a purely secular issue as stated in an earlier post; marriage was created by God between one man and one woman. The Bible further instructs that "...a man shall not lie with a man as he does with a woman". How much clearer can it be? For those who think the Bible is an outdated book with no relevance to the world of today; people have not changed since our creation. We are the same now as then; again from the Bible "...there is nothing new under the sun". So it is an extremely relevant book which has much to teach us all. Catholics DO NOT believe in gay marriage. They believe in traditional marriage as outlined in the Scripture between a man and a woman. They do not condemn gays, nor anyone else and teach tolerance for everyone. Christians call themselves Christians, you can call yourself Mickey Mouse, but that doesn't make you Mickey Mouse. an attorney...IT AIN'T WHAT YOU SAY , IT'S WHAT YOU DO..how hard is that to understand. It's OBAMA or JESUS. CALL IT. Catholics DO NOT support gay marriage. They believe in the traditional union between a man and a woman....but they do teach tolerance and respect for all persons. people...what do you think the Lord's judgement is a chess game . You can't pick and choose whate Jesus taught ..
so you can be politicaly correct..you really can, but, you will stand before the lord on Judgement..a dangerous trade off. naturally like your web-site but you have to take a look at the spelling on several of your posts. Several of them are rife with spelling problems and I in finding it very bothersome to tell the reality nevertheless I'll definitely come back again. IHonestly, these statistics are probably overblown. I don't see any sources of knowledge, or mention how they were acquired, or the process which was undertaken to determine these statistics; especially the ones showing the percent of Roman Catholics which approve of Gay Marriage. What'a farce. Second of all, you should have the right to marry whomever you want to marry under a true secular government, which entails that ours isn't totally a true secular government. I want to see Biden get the Pope on board, first. Men didn't write the bible. God did. So actually you do believe in the rules of men because man has made you believe God doesn't exist. Banning gay marriage is the Bishops' obsession. Most Catholics don't care one way or the other. In my opinion, it is a purely secular issue and should remain so. Personally, I don't support it, but can not find any reason beyond religious reasons to ban it, so it must remain a personal choice. God's greatest gift is free will, so who are we to infringe upon that? All 'Catholics' do care. Its all the make believe Catholics don't care one way another. Catholic teaching is ungodly. it is no surprise. Whether or not Catholic teaching is "ungodly", its teachings have nothing to do with the opinion of the majority. Obviously the polls are incorrect because the majority of states are voting that marriage is between a man and a woman. If you believe in God than you believe in his rules. It's not a matter of judging. It's a matter of not accepting something that is against the teachings of God. Simple solution to the problem Kay, I don't believe in god, or the rules that men have written and then attributed to their invented deity. I don't automatically respect the laws of men, just because they've been written down. They must also be just. Can you point out the rule in your 10 commandments?